Just like any other driver, you want to have enjoyable sound when you have to be behind the wheel. For this to happen, every feature of the stereo system must be top-notch – from the head unit and the amplifier to the speakers. Car speakers are the producers of sound and for many of us, what we hear is all what we care about. Until something unusual is noticed about the way speakers deliver sound, few drivers don’t give the audio system much thought. When you choose speakers properly, you are done with more than half of the journey toward better sound quality. There is a lot of information online on the best car speakers. If you want to know more about choosing specific types of speakers, Speaker Champion covers various types of car audio equipment. This article takes an unusual approach to explain in a more descriptive way the factors that influence sound quality. As you read on, you’ll systematically open up your car speaker (in your mind) and inspect the functioning of one speaker part after the other. In the end you will be well informed about car speaker anatomy and can confidently choose the best speaker that will improve sound quality in your car. Which is the best cone material for better sound production? How does the nature of the dust cap affect sound quality? How does the spider and surround material affect my choice of car speaker? Which qualities should I look for in speaker magnets and voice coils? Are crossovers that important to speaker performance? Each of the 8 elements has a specific influence on sound quality. We will explain each of them in a relatively simple language. You will not need to be a physics guru to understand, and we promise not to scare you with the mention of Sir Isaac Newton. Before we start tearing up our speaker, it’s important to understand how sound is produced so that as you read on you’ll be able to connect how different speaker elements function. All car speakers are electric devices that take in electrical signal, generate motion using the signal, and finally output sound that can be perceived by the human ear. The sound production process starts from the voice coil, a current carrying conductor. This conductor is usually placed in a magnetic field between the pole piece and the top plate. The current flowing to the voice coil varies according to the nature of signals sent from the sound source – a music player, phone, or radio, for example. This variation of electric current causes the voice coil to move in and out of the magnetic field. If the voice coil was big enough, its movements would create sound. But for reasons related to the overall cost and performance of the speaker, it cannot be made big enough to cause air movements that can result into sound production. That’s where the diaphragm (cone) and the spider come in – provide more surface area to push more air and thus generate audible sound. So, motion is generated by the coil and magnet and sound produced by the spider and the cone. What’s the purpose of the surround, dust cap, and basket? The surround (suspension) attaches the cone to the basket. Together with the spider they help to control cone movement. The surround dampens sound waves and act as a mechanical termination of cone movement. A dust cap prevents dust and other small particles from getting into the voice coil. It can also serve as a frequency radiator for response extension. The basket holds everything together for smooth and efficient sound production. These two parts are connected and are the key elements that cause air movement and sound production. The cone – precisely its design, size, and material – greatly affects midrange dispersion or range. Which is the best cone material for better sound quality? The material used to create the ideal speaker cone needs to be as stiff as steel and at the same time as light as feather. But the ideal speaker is still a work in progress. Usually, the lighter and more rigid the cone material, the better the cone follows the signals sent to it, and the better the sound produced. Polypropylene cones have been proved to be the best performers mainly because they can control break-up, meaning they are able to produce flawless high-frequency roll-off. Paper treated with additives such as kelvar, ceramics, rubber, or exotic items also performs well. These additives make paper cone stiff and lightweight, which are the requirements of the best speaker cone. However, a paper cone can absorb air moisture, which would change its mass and damping characteristics. Paper cones perform best in mids and woofers. Since twitters vibrate at higher speeds, the best materials for their cones are metals such as titanium, silk, and aluminum. Apart from preventing entry of unwanted particles into the speaker assembly, the dust cap can also act as a stiffing membrane for the cone if it’s hard enough. Inverted dust caps further improve the rigidity of the cone, making it more efficient in responding to frequencies. Some dust caps are permeable to help in the cooling of the voice coil as well as the voice coil gap. The speaker surround and the spider perform similar functions all related to controlling cone movements. The surround helps to keep the diaphragm centered while the spider controls the mass of the cone. They also force the voice coil to maintain linear forward and backward movements so that it does not scrape the narrow magnetic gap. The best spiders and surrounds are designed with proper stiffness and linearity to ensure that they don’t add their own resonances. These two properties also determine the low frequency limit of your speaker’s useful bandwidth. The rigidity of the material used the surround and spider is the key consideration to make here. A typical speaker surround is made from cloth, foam or butyl rubber. Foam isn’t great as it rots fast. Rubber doesn’t rot and is more stable though more expensive than foam and cloth. Cloth or treated cloth is used in many high-end speakers because it lasts long and allows the cone to move and produce sound more efficiently. Relatively loose spider and surround material for good quality sound and good mid-bass. The stiffer the material, the better the mids and highs but the poorer the lower frequencies (bass), especially when the speaker is small. If you want more bass, a bigger speaker with looser spider and surround would be your best pick since it allows for deep bass extension. Note that loose spider and surround material in a smaller speaker are absolute trouble since the speaker will neither play great highs nor good bass. These parts interact to convert electrical energy into mechanical energy that causes the spider and diaphragm to move. The magnet’s size and type affect its performance as well as the overall performance of the speaker. Bigger magnets are preferred because they produce more powerful magnetic fields, which makes the speaker more sensitive or efficient. The sensitivity rating indicated on speakers (in dB per watt) depends on the size and performance of the magnet. A bigger rating implies that the speaker will be louder at a given amount of power. The strength of a magnet also affects other sound performance aspects such as damping. Neodymium and ferrite magnets are the most common types in car speakers. Are you interested in a lighter speaker? Neodymium speakers are preferable as they reduce the weight and size of the speaker. Ferrite magnets are known to work well in varying temperatures conditions. The voice coil: The performance of cars speakers improves with the size of the voice coil. A bigger voice coil (greater diameter) has better control over the cone than a small cone. However, smaller voice coils are not necessarily bad performers. In a speaker with a smaller coil, the diaphragm is more resonant and the speaker may seem more efficient at the one additional resonant bass note. Car speaker baskets are constructed with either plastic, stamped steel, or cast aluminum. Metallic baskets are great for bigger and heavier drivers (more than 6 inches) where rigidity and durability are required. A well-designed molded plastic frame will give you better acoustics than aluminum or steel ones. In high-efficiency car speakers, plastic baskets are filled with fiber for more rigidity, which offers the advantage of dampening residual vibrations. Speaker frame is not a major contributor to sound quality performance but more of a determinant of speaker structural quality, durability, and price. However, a frame that allows for heat dissipation and proper functioning of the other elements definitely influences sound quality. Although the crossover network is not present in every speaker, it has a great effect on how a speak sounds. The presence of crossovers has a positive influence on sound quality. Speakers with multiple drivers need crossovers to divide frequencies between the drivers. High frequencies are sent to the tweeter(s) and low frequencies are directed to the woofer. A great speaker has a combination of high-quality drivers and effective crossovers to ensure that every driver receives the range of frequencies it can produce well. Your speaker produces accurate frequencies, so you can enjoy definitive highs and lows. A rigid but sufficiently rigid cone material like polypropylene is required for efficient sound production. Stiff surround and spider materials are perfect for great mids and highs, while looser materials in a big speaker can result to awesome bass production. Not all car speakers have a spider fitted while others may even have more than one spider. Since the spider increases the surface area for production of sound, its presence makes the speaker able to produce more sound. Stronger magnets and bigger voice coils make the speaker more sensitive, which means they can achieve higher volume at lower power levels. A crossover network enables the accurate delivery of frequencies by different sound drivers. Speakers with crossovers are therefore better in sound production than those without crossovers. 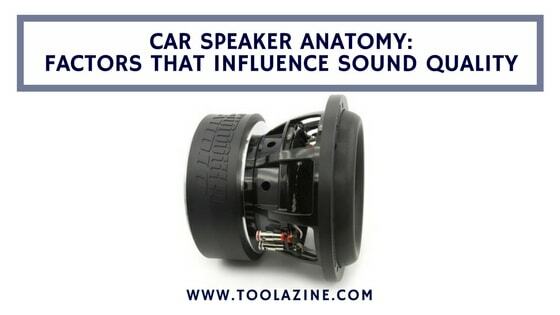 You are now more informed about car speaker anatomy and function. With a good understanding of every part of your car speaker, it is easier to determine the properties you want in each element so that the overall sound quality delivered is improved. For more speaker info see Speaker Champion. The best can also depend on what your criteria is the BOSS car speakers are quite good. You can get them here on Amazon. A pressure washer can be a great way to wash your car. Check out this review of the best pressure washers for washing cars. Learn how to wash your car the right way. Don't do more damage by washing it. Are you drying your car with a synthetic chamois? Is that the best option?